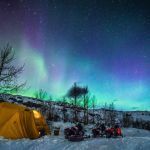 Companies that rent camping gear and outdoor equipment in Alaska. We rent gear for virtually every type of Alaska outdoor activity; fishing, ice fishing, skiing, rafting, camping, and backpacking. If you need it for the Alaska outdoors, we have it! Quality fishing gear for your Alaskan adventure. Kachemak Outfitters provide gear rental packages for your adventures in Kachemak State Park, Katmai and Lake Clark National Parks. "Your Gear Is Already Here"